Relax and take some time out whilst staying in this lovely, well presented and spacious family residence. The pole home is set high on a 5 acre property with stunning views over looking Wilson Inlet and the grounds of Forest Hill Winery. 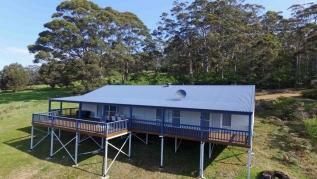 Be surrounded by delightful farmland and beautiful natural bushland. 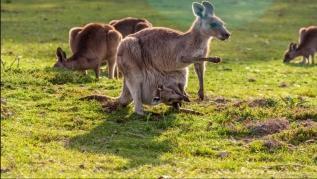 Watch the kangaroos that visit us every morning and evening and listen to the beautiful native wrens and parrots amongst the forest trees and low bushes. The views from the balcony are truly beautiful and the country air and open space is completely refreshing. The location is perfect for a cosy winter get away or to enjoy the outdoors in summer. The local beaches are stunning any time of the year. Whether you prefer the beauty of the rugged Southern Coast, the majestic rock faces, surfing at Ocean Beach, fishing at Parry’s Beach or sheltered Green’s Pool, walking the many and varied bush tracks, tasting culinary delights at our wonderful restaurants, visiting our various wineries or breweries, the Denmark region has something for everyone. This lovely home completed in 2011 has an open plan design and modern facilities. High raked ceiling in a large open living; kitchen and dining area give a light and airy atmosphere. The floors are beautiful bamboo, which are warm in winter and cool in summer. Bedrooms one and two have queen size beds and bedroom three has a bunk bed and a single and licensed to accommodate a maximum of six people. The bathroom has bath and shower facilities and the laundry has a washing machine. The outside decking is spacious with a large outdoor setting and barbecue for you to enjoy the view while you have your meals and soak up the ambiance of tranquil Denmark and Ticketyboo vista. We are approximately 6 kilometres from town centre, which has lovely coffee shops and an array of specialty boutiques and shops to browse in or to buy your groceries. The surrounding area has scenic roads, which lead to many fabulous wineries and cafes. Albany is a 40 minute drive away and it is an easy drive to the tree top walk in nearby Walpole. Water to the property is filtered from our fresh water tank and guests are reminded to conserve water and be ‘water wise’. Accommodates up to 6 people with 3 bedrooms. 2 queen size rooms and a 3rd room with bunk & single bed. Minimum stay is 3 nights standard periods and 5 nights in peak periods. Sorry, no pets allowed and this is a smoke free property. My family and I had a wonderful week at Ticketyboo in Denmark,none of us wanted to leave. It is a great house to stay in – clean, comfortable, incredibly well appointed, and the most beautiful views.